Established in 1637 by the Dutch after they destroyed the regions' former capital of Olinda, Recife is now the second largest city in Northeastern Brazil and is capital of the state of Pernambuco. Originally built as a port city it is now a large exporter of sugar, cotton, and coffee. The city also has a large amount of small and picturesque fishing villages surrounding it. Recife received its name from the Portuguese word for reef, refering to the coral reefs that line its coast just beyond the city's many beautiful beaches. The Recife area has only recently become a tourist attraction, and has come to be popularly known as the Venice of Brazil for its many connecting bridges, canals, and small windy streets. Before the Dutch invasion, when Olinda was still the capital of the state of Pernambuco. Recife was simply a small port village, with the first settlements in the region being marked in the early 1530's. In 1630, however, the Dutch invaded Olinda, and created a lot of damage. However in 1637, the highly revered Dutch governor Mauricio de Nassau arrived in Recife and started a process of urbanization, with artists and architects coming from Holland to help form the city. This left the city much richer culturally and intellectually, and after the Dutch left, Recife continued to grow and expand. A large contributor to this expansion was the original Port that the city held, as it provided a lot of wealth and turned Recife into an important trading center. Rivalry erupted between Olinda and Recife, and the Guerra dos Mascates resulted in the early 1700's. The continued success of Recife as a commerce center enabled for the city's industrialization in the early 20th century, and within the past several years attention is being focused on tourism as the city offers a rich history, great beaches, and many interesting and beautiful sights. 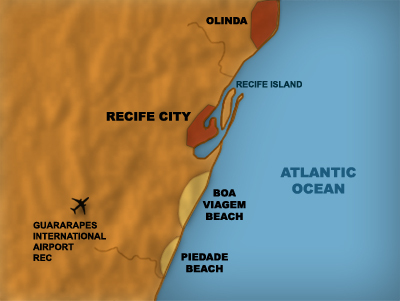 Recife is a main gateway city into the Northeast, so flights are frequent and widely available. Flights: United Airlines, Nordeste Linhas Aereas, Varig, TAM and Gol all serve flights to Recife from major Brazilian cities. Bus: All buses cost 2 Reals, but Recife is easily navigable by foot: all sights in downtown are at walking-distance from each other, and the streets are beautiful to explore. A 15 minute bus ride from Boa Viagem takes you downtown. To get to Olinda: Buses leave from Boa Viagem (the main hotel sector): they are marked Setubal-Principe and Setubal-Conde da Boa Vista. Taxi: Taxi's are safe, relatively inexpensive and can be hailed from anywhere. The wealthy beach area of Boa Viagem is the most popular location for tourists to stay in, with a wide selection of good hotels, beach life, restaurants and nightlife. Downtown does not offer any great hotels and at night is not a safe place to stay. In the Old Recife part of the city, you can find very good restaurants that are open late in the evening; the downtown area has many great restaurants as well but, as they cater mainly to the business crowd, they close early. Recife has beautiful streets and many beautiful old churches and buildings to explore. Old Recife has a large section worth spending a day strolling through, observing and entering old Dutch-origin buildings. With a rich history, Recife has several interesting Historical museums. Included is a list of Museums in Recife.